WP Media Folder is a WordPress plugin that enhances the WordPress media manager by adding a folder manager inside. In order to install our plugin you should use the standard WordPress installer or unzip and put the whole folder in /wp-content/plugin. Then click on activate plugin to see WP Media Folder menu appear on the WordPress left menu. In order to update the WP Media Folder, you can use the WordPress default updater. You can also remove and install the new version from a .zip file downloaded from www.joomunited.com. In any case you won’t lose any content because everything is stored in a database. Then use your JoomUnited account login and password. After a successful login the button turns to blue with a text Disconnect my JoomUnited account. Finally, you can update all the JoomUnited commercial plugins from the WordPress standard updater. Do you want to import the post categories as media folders? Do you want to import NextGEN galleries as media folders? Hit Yes to proceed or Dismiss to ignore. The main idea of WP Media Folder is to classify media directly from the media manager. WP Media Folder works on the native media manager, both from the public and admin side. For example you can use it in posts and pages. To use WP Media Folder just click on the Add Media button. Click on it to open the main media view with the folder management. There's a button to create a folder and directories are listed below. When you click on Create folder you have to type a name and validate the creation. A single media can belong to several folders. When you click on a file look for the Media Folders selection setting in the the right side column and click on it. You can also use the WordPress media manager to batch apply multiple folders to multiple media. First, click Bulk Select, pick media files and then press the Media folders selection button. In order to move one or several media in a folder, click on the media and drag it into the folder you want. You also have the possibility to drag multiple images into folders or into the folder tree. First select media. Then drag media into folders. A notification will then be displayed with the possibility to UNDO the last media move you've just made. The folder can be renamed by double clicking on the folder on the left panel or right clicking on the folder and choose Edit Folder. In order to remove media, right click on the folder and click Delete button. If you remove a folder with media inside, by default all media inside will go back the root of the media manager. You also have a parameter to remove folder and the media inside the folder - use with caution! You can also change the color of folder from the Change color menu. The media and folders can also be managed from the WordPress media manager view. You'll also see existing folders from the media view. Note that article categories are automatically added as folder. To upload media in particular folders, select one and click on Add media. From the folder tree you can ensure that you're in the right folder. In order to filter media, you can click Sorting / Filtering button. Media can be arranged by media type, category, dates, minimum and maximum size (in px), weight ranges. WP Media Folder adds some new features to the default media manager. You'll find all the settings in the plugin configuration General > Media Filtering. You can use default ones, remove some filters and add you own. From the configuration you can setup the weight and size filters ranges. Note: when you apply an ordering it will be automatically saved in your session using cookies. It means that next time you'll open your media manager, the media ordering will remain the same. In order to add a Youtube video, you can click the Add New button or Media icon as the image below. Next, a text box will be displayed on the screen where you can paste the YouTube link. Then you will see a YouTube file among your media. WordPress has a native inbuilt gallery function. We've chosen to offer a enhancement of this feature based on the folders. 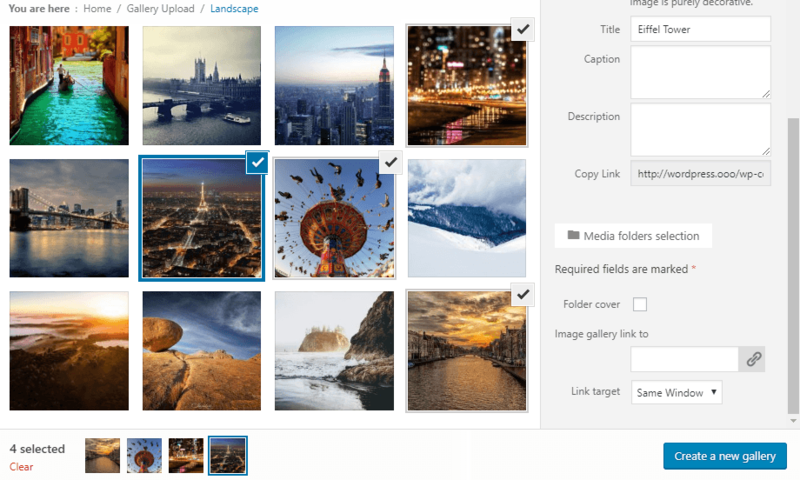 You will be able to create galleries from folders or from a selection of images. If you experience bad quality images in case of a big thumbnail display, for example a big width gallery on 2 columns, we recommend that you load medium or large image. The default gallery will override the WordPress default gallery theme. If your theme already has a styling option for the WordPress gallery, you can disable this feature. You can define custom links per image in the gallery, which can be very useful if you need to create a homepage layout based on a gallery that redirects to pages or posts. While editing galleries, click on an image and look at the right column options. You can define an internal or external link to this image using the WordPress default link manager. You will also be able to define the target where the link will open as the same window, or a new window (new tab). The first gallery option is the theme choice. The default theme is an enhancement of the WordPress default theme, bringing you lightboxes to images. Masonry will display a wall of images with fixed width and fluid height. Portfolio theme is a stylish gallery with hover effects, titles and captions. The slider theme is a horizontal slider with title and captions. Each image has some options in a gallery. Click on an image to see them. WP Media Folder has a NextGEN gallery importer. Once the plugin is installed, WP Media Folder will detect the NextGEN gallery installation and you'll get a notice to import galleries. Each gallery will be imported as a single folder with the name of the gallery as the folder name. You can show your galleries in Gutenberg editor now. 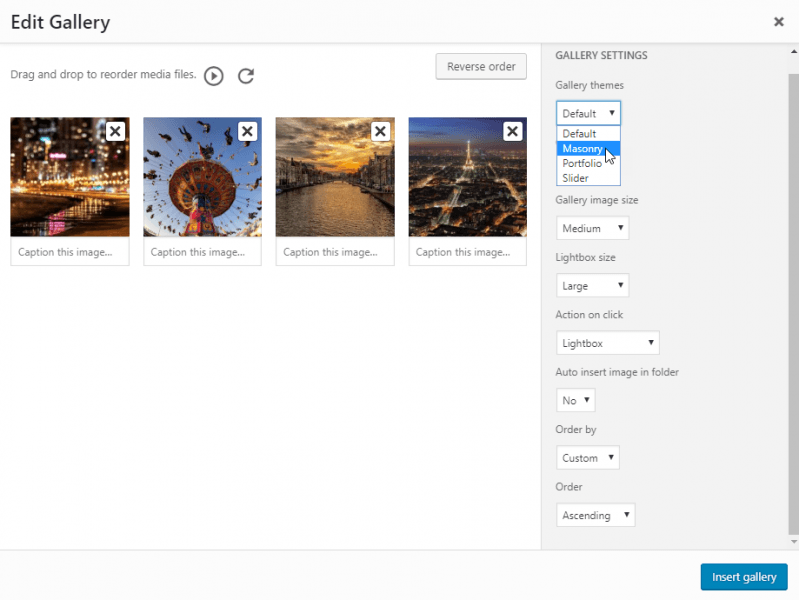 In order to display a gallery in Gutenberg editor, clicking on the WP Media Folder Gallery button in the Common Blocks category. Then you can select images from your library or upload directly from your PC. After that, you can edit the gallery or add more images. There is an option to embed a PDF file when inserted in Classic Editor. Now you can do in Gutenberg editor also. First, you click on the WP Media Folder PDF Embed button in the Common Blocks category. Then you press Add PDF button to embed a PDF file. After that, you can edit by hitting the Edit PDF button. Global settings are available through the menu Settings > WP Media Folder > General > Main Settings tab. Gallery image size and settings: Choose which image sizes will be available to be chosen in galleries. WordPress has 6 sizes of images defined by default in the media settings. Once you install new plugins, a new size can be added. For example WooCommerce is adding a custom size for its products. You can choose which size to load in the image galleries here. You can go to Settings > WP Media Folder > Access & Design > Media Access tab. WP Media Folder has an option to limit media display and management to the user's own media only. When a new user is created, a root media folder is generated for them, with their name and all their media inside. They can create subfolders inside. As an administrator you have an option to display or hide your own media right inside the media manager. A tool is included to import a massive amount of media from a server folder in the native WordPress media manager from the plugin Settings > WP Media Folder > Server Import. Select a folder and/or subfolder, click on import, and it’s done! All the folder structure and media are now available in your native WordPress media manager. It imports the folder structure and all media inside. Then just click Add and Save Changes button and wait for the next sync. Note: You should not import/sync files from the current upload folder. If not, you will create an infinite loop. For example: "03" is the upload folder: "wp-content\uploads\2019\03"
The WordPress media manager handles not only images, but also documents and other file formats (like PDF, zip files). We’ve included a function to add you design on files. You can define a button and font colors, and instead of a basic link to a PDF file, for example, you'll get a real download button. You have an option to automatically rename your media on upload, respecting a pattern you’ve defined, which is useful for SEO. You can apply image watermarks to your media - a non-removable watermark visible by your end-users. First, you need to enable the Images watermark feature at WP Media Folder configuration > Rename & Watermark > Watermark tab. Then select an image that you want to set as watermark. Next, you can set the adjust the scale of the image or set the margin for it. After that, you can select which image sizes can be applied on and tick on the folders to exclude the watermark. Finally, clicking the Thumbnail regeneration button and save the settings - all the images in your media library will be regenerated with a new watermark. We've added the service in the left menu Settings > WP Media Folder > Image Compression because we consider it's a big performance improvement but it's not mandatory to use it. Our members can get a 20% OFF coupon on all membership from the configuration page. If you are using WPML and want all your files and folders are translated into all languages, please navigate to WPML > Settings > Taxonomies Translation and then tick the buttons on Not translatable column of both WPMF Categories and WPMF Gallery Categories; or just WPMF Categories if you do not use Gallery Addon. Note: Don't use WPMF Categories (wpmf-category) in the WPML > Taxonomy Translation. If you select the WPMF Categories, all your folders will be duplicated. Please take a look at the image below for more details.